It seemed it wasn’t only I who had gone through the anguish of hard, refrigerated butter ripping through my toast. I got a few, but quite earnest, questions about the French butter bell that I showed in my last post. How does it work? Can it really keep butter soft and spreadable without refrigeration for a month? Will it work in Manila? First time I saw a butter bell, I couldn’t even imagine what it was for. It had two parts: a little pot and an inverted cup that also served as a lid. The design made even less sense when I was told it was for storing butter. The crock was supposed to hold the water and the cup, the packed-in butter. And that’s all there was to it! Flashback to a typical breakfast scene: Rama exasperated at the hard lumps of butter that refused to budge and spread on her toast; Poch and I glancing at our mangled toast in the oven, the butter seeping through its cracks. The thought of another unpleasant morning involving butter and toast did it. We went ahead and bought the Le Creuset Butter Crock. 1. Take butter – about one stick – out of the refrigerator and leave until just soft and easy to slice with a butter knife. 2. Fill the bell with butter up to about 1 cm from the rim; make sure it’s packed in. Fill the crock with 1/2-3/4 inch of water (Le Creuset has a “fill line” mark). 2. Do not top up old butter with fresh butter. Wait till butter in the bell is finished, then wash both bell and crock thoroughly. When completely dry, refill with butter. Change the water regularly. 3. Use clean butter knives. 4. Keep where temperature is at 80F (27C) or lower. Other names for this late 19th century French-designed crock are: “French butter keeper”, “French butter crock”, “Butter Crock”, :Beurrier à l’eau”, “Beurrier Breton”, “Beurrier Normand”, “Cloche de beurre”, and “Pot à beurre Breton (French) Butterdose(German)”. Two manufactured versions are the Norpro Butter Keeper and the Butter Bell (a registered trademark of L. Tremain,Inc). A friend couldn’t believe that I spent a fortune on my Japanese knives. Why, she asked, when most restaurant chefs would use ordinary $10 knives. What she didn’t know, of course, was that those were restaurant-supplied knives. What restaurateur in his right mind would invest in expensive knives that he knew would simply be thrown around in the kitchen by the commis and mindlessly tossed into the dishwasher by the busboys? If I had a maid, if I didn’t have to cut and chop the food myself, if I didn’t yet know the deep, inexplicable pleasure of feeling the blade slice ever so smoothly through a tomato, if I hadn’t ever held a knife with such reassuring heft and balance, then an inexpensive knife would certainly do. I swear nothing’s as perfect for cooking adobo and our other vinegary stews as an enamelled cast-iron dutch oven. Somehow, stainless steel taints the dish with a subtle, but off-putting “tinny” taste, close to that of raw vinegar. This is where I cooked my best adobo yet, and two other dishes I had cooked before – Moroccan beef stew and kare-kare – also turned out much better, with more intensified, well-blended flavors. Why Le Creuset? Well, it’s a classic that’s been around long enough to trust (86 years, to be exact). And it’s still produced in a foundry in France, using time-tested sand casting methods, finished by hand and sprayed with 2 coats of enamel, each fired at 800°C. That’s solid, single-piece construction which, in the kitchen, translates to even heat distribution, the kind we need for slow-cooking, braising or roasting. I’m told I can even bake bread in it! First, I fell in love with the design. Then I marvelled at the engineering. Just power on, pop a pod, push a button. No more fumbling with the coffee jar, no more eternities to wait for until the coffee steeps. No surprises; my coffee would taste the same each time, not bolder nor blander than the day before or the next. Best of all, no more coffee moments marred by having to trash the dregs or hose them down the drain. There’s more to mornings, and life, than struggling to make a perfect cup. I’d rather try perfecting a sunnyside-up. Trust the French to find a way to keep butter fresh and spreadable, for up to 30 days without refrigeration. 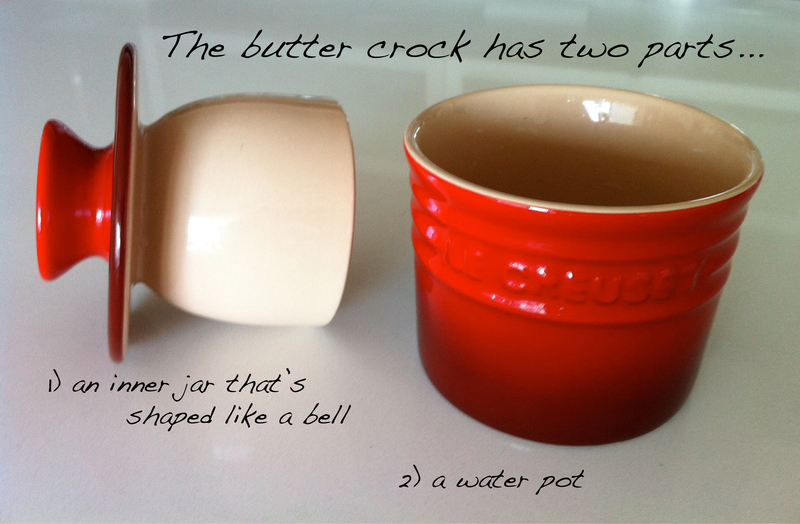 It’s such simple science – all a butter bell (also called butter crock) needs is about half a cup of cold, fresh water and a cool spot on your countertop. No longer ripping my toast with hard, refrigerated butter… wow, that’s life-changing. They look and feel like the Noritake Colorwave Stoneware set I have in Manila. But at $2 a piece, they don’t break my heart everytime I break a bowl or a cup. And so the following morning, it was breakfast fit for this batang maton, the little thug who grew up in Singalong, who secretly hammered thick, long wires into deadly arrows, to arm a band of little kids against the spectre called Boy Bina, leader of the snotty rogues who lived across the street. Don’t mess with me, kid! I eat baboy rrrramo for breakfast! 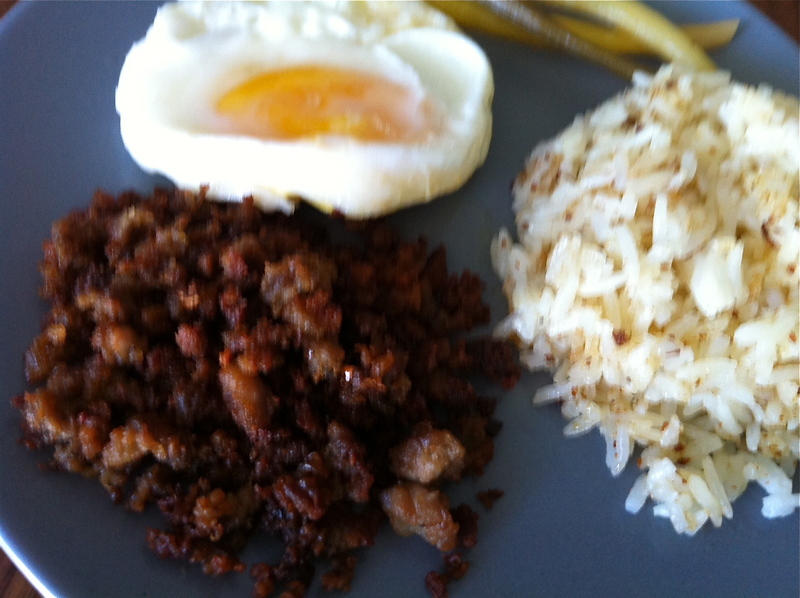 Hubad na langgonisang baboy ramo, fried egg, fried rice and pickled beans. Of course, he was boasting. 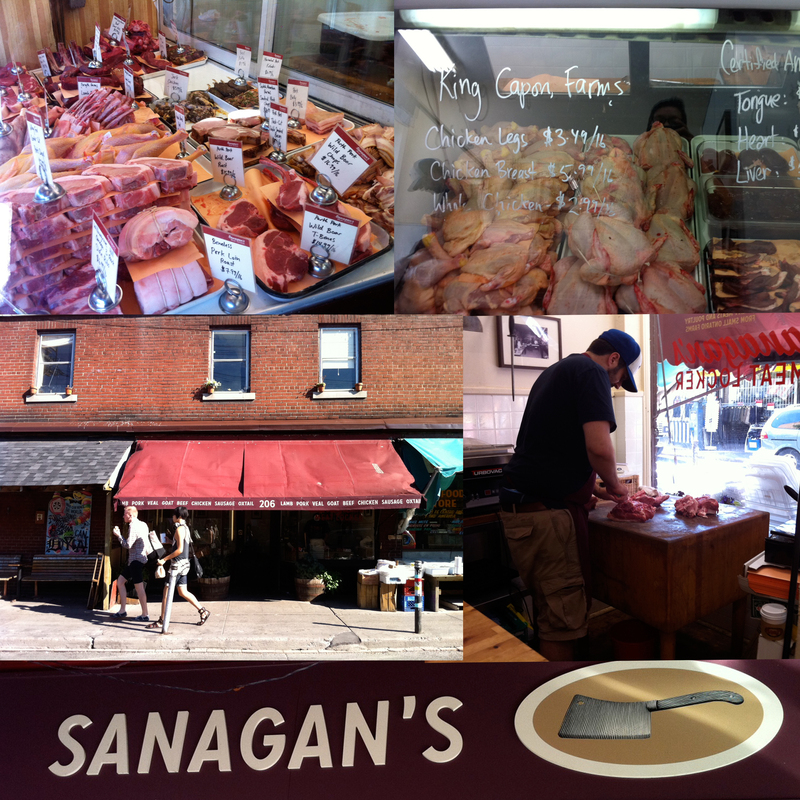 Sanagan’s Meat Locker in the Kensington Market carries just about any kind of meat and poultry: rabbit, goat, venison, Berkshire, Tamworth and Iron Age pork, quail, capon, pheasant, name it. And you’ll find the animals’ prized internal organs here as well: tongue, heart, liver. I haven’t seen horse meat nor foie gras sold in the store, though. But I’m sure if I asked and PETA wasn’t looking, they could easily score some of this stuff for me. I also love that their meats are organic or naturally raised and locally sourced. The wild boar, for example, was from a small farm near Stratford, Ontario, raised in the same field and forest conditions as its natural habitat. I was about 8 years old when I had my first taste of wild boar meat. My Tito Dado brought a bayong-ful from Cagayan Valley where he was assigned as captain in the Philippine Constabulary. My young mind conjured up images of a wild hunt, my uncle’s rifle still smoking, a huge, bristly but limp boar slung on his shoulders. I know now that my uncle always told tall stories, but the one about the boar that he stalked for days I believed completely. Tapang baboy rrrramo, he rolled his r as he laid the meat on the table. It was trophy meat, lean, deep red, with a taste as dark and wild as the forests it foraged. I found this recipe for Langgonisa using Baboy Ramo in Memories of Philippine Kitchen. This was the first time I was making sausages, so I opted to prepare and serve this hubad, or “naked”. Wrestle the wild boar into tiny pork casings? I wouldn’t dare. Wild boar meat is lean, dark red, gamey - but low in cholesterol! Combine all the ingredients in a large bowl. Mix very well to incorporate all the ingredients. Cover and refrigerate for at least 2 hours or overnight. Pan-fry using canola oil. Finally, my recipe for kare-kare! 1. Wash oxtail pieces thoroughly and place in a pot with 6 cups of water or enough to cover. Add the smashed garlic cloves, dried bay leaves and the roughly chopped onions. Bring to a boil, then reduce heat to simmer, until meat is fork-tender, about 1 1/2 – 2 hours. 2. Remove from fire and drain when cool enough. Discard the bay leaves, onions and garlic pieces; remove the oxtail and set aside in a bowl or ziplock bag. Transfer broth into a bowl or pot, cover and refrigerate overnight to separate the fat. Refrigerate the oxtail pieces, as well. 1. Skim the separated fat from the oxtail broth and reserve 3 tbsp. Discard the rest. 2. In a casserole over medium heat, sauté the minced garlic and onions in the oxtail fat until onions are softened, about 3 minutes. Add the tomatoes and cook until softened, about 2 minutes. Stir in the peanut butter until creamy and well-blended. 3. Add the reserved broth and cook for 15 minutes, then add the oxtail, ground rice, peanuts and achuete oil. 4. Season with salt and continue to cook until the broth has reduced partially, about 20 minutes. Keep in mind that vegetables will be added later and therefore the stew must not be too thick. Add some water if needed. 5. As the oxtail simmers, prepare the vegetables. Blanch the bokchoy, eggplant and long beans in a pot of salted boiling water and immediately transfer to iced water in order to stop the cooking process and let the vegetable retain their color and crunch. Drain, then arrange in a platter. 6. Just before serving, mix the vegetables with the oxtail, or serve separately. 7. Serve with bagoong on the side. I lost my blog for the stupidest reason: I failed to renew my domain subscription and someone else was quick to buy it. I lost all content, all of 200+ blog posts, all published between 2005 and 2010, the 6 most significant years of my life in terms of food, wine, travel, love. My last post – one about my trip to Montreal and a memorable dinner at Au Pied de Cochon – was in August 2010 and I hadn’t written since. Then, many months later, as a postscript, I wrote that I had published my entire blog into a book using an online app. It’s a beautiful book – two volumes, hardbound, full color, glossy paper – proof, at least, that my blog once existed, a record of a life with its many distractions, each one pursued and indulged, and their stories generously shared. But the book could well be proof of the inertia I was in. Many things were happening in my life, too fast and urgent to put down in writing: my retirement, my eventual immigration to Canada. Lazy and impatient to write, I decided to yank tennisandconversation out of cyberspace, give it physical form, a finality, and maybe, some permanence. If there’s any good that came out of losing my blog, it was this: a reason – no, the compulsion – to write again. So here I am, albeit with a bit of effort, cranking my first post. I’m bobbing up for a second wind.